Specialist Teacher Pam originally trained as a radiographer, but then got involved with adult literacy work, first as a volunteer, then as a tutor after gaining a Open University Degree and Post Graduate Diploma. Pam taught Essential Skills at North & West Essex Adult Community College, which included working with adults with severe learning difficulties, teaching Communication Skills, Everyday English, Basic Numeracy and Dysphasia. Then Pam became the Course Trainer in City & Guilds 9282 Initial Certificate in Teaching Basic Skills at the College. Pam then moved back to Stone, and started teaching adults and children for the Dyslexia Institute, then became an Adult Development Specialist at the Institute. Pam worked for Dyslexia Action (was Dyslexia Institute) for over 12 years where she eventually became Principal, until she retired in 2012. 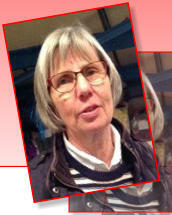 As Principal she was responsible for teaching, assessment, dyslexia screenings and raising awareness of the condition. Pam was delighted to be invited to help with Chuckle, and really looks forward to working with the children. In her spare time Pam loves to read, get into the garden, patchwork and to do Yoga!